"Don't be absurd (fig. 1). How could I be in a position to have a wife? (fig. 2) And just which family's daughter is this girl anyway?" (fig. 3), Tanjirou asked. Note the use in fig. 1 of the colloquial equivalent of the word 「つまらない」 to mean "absurd" or "foolish" ― one of its secondary meanings. In fig. 2, Tanjirou utilizes the "compound" word 「女房どころ」. I wasn't exactly sure how to interpret this, but I took the suffix 「どころ」 to mean the compound as a whole referred to the place where the prefixed word （「女房」, or wife） was located. Matt explained this in a comment for the next post ― it means "to be in the position". Although nothing in fig. 3 directly suggests the word "family", I translated it as such because it was implied through the use of the word 「娘」 ("daughter"/"girl"). As we see here, 「どこ」 can be used for both the physical house and the family associated with it. Finally, note how Tanjirou softens the ending with 「だらふ」 （「だろう」 in modern Japanese）, rather than asking directly with an interrogative particle, such as 「か」. Although I'm no expert on Edo-period social norms, Tanjirou's attempt to sound coy here automatically suggests to me that he's concealing something. "I think she said her family is in greengrocing (fig. 4). But that's doesn't really matter, does it? (fig. 5) More importantly, you (fig. 6) probably didn't even bother to remember the likes of me now, did you? (fig. 7)"
Note the historical kana orthography in fig. 4 that leads to 「八百屋」's furigana to be written as 「やをや」, rather than 「やおや」. We've seen 「お」 be replaced by 「ほ」 before, but I don't think 「を」 instead of 「お」 has been encountered. There's a parallel to the modern use of 「は」 as a particle even though it's pronounced as 「わ」 in that the modern particle 「を」 is pronounced as 「お」 ― both are cases of historical kana orthography not being entirely eliminated in modern Japanese. We see Yonehachi's histrionics begin with fig. 7, and it was here that I ran into a little trouble with the translation. But first a few notes: the frequent use of 「マア」 here implied a certain nonchalance (in this case, on Yonehachi's part) regarding the entire situation. Also, the word 「なんざア」 essentially means the same thing as 「など」, which I interpreted to mean "the likes of" here. As explained here, 「なんざあ」 is a sound-shifted word that can be broken down into 「なんぞ」＋「は」. I couldn't figure out what kanji corresponded to 「くん」 in fig. 7 or what its meaning was. It seemed to me the top radical might be 「口」 or 「日」, while the bottom one might be 「六」, but I couldn't find any matching kanji. However, the overall meaning of the sentence was nevertheless relatively easy to decipher, given the context. Edit: Using yudantaiteki's suggestion that the kanji before 「なさる」 might be 「呉」, I searched for it online and came up with a Google Books result, which appears to contain an unrelated example that confirms that the kanji is indeed 「呉」. 「なさるまい」, as explained here, is the honorific verb 「為さる」 ("to do") in the predicative form （終止形） combined with 「まい」, which is an auxiliary verb that both negates the preceding verb and makes it a "guess" (i.e., it is uncertain). At first, the final character in fig. 7 might appear to be the kanji 「子」, and since the attributive form （連体形） of the verb 「まい」 is also 「まい」, it would make grammatical sense as well. However, it obviously doesn't fit the context, and it turns out it's actually a kuzushiji for 「ね」. "And it's OK (fig. 8) even if you don't try to cover up what I heard in the rumors about you having a wife, isn't it? ", Yonehachi asked (fig. 9). The only real confusion here was which kanji were used for 「かみさん」. Although the meaning was quite clear, I wasn't sure about the first kanji and had no idea about the second. The first looks a lot like 「円」, but not only does it have no relation to 「かみ」 in terms of the meaning or reading, it's a simplified kanji （新字体）; the kanji in use when Umegoyomi was written would have been 「圓」. 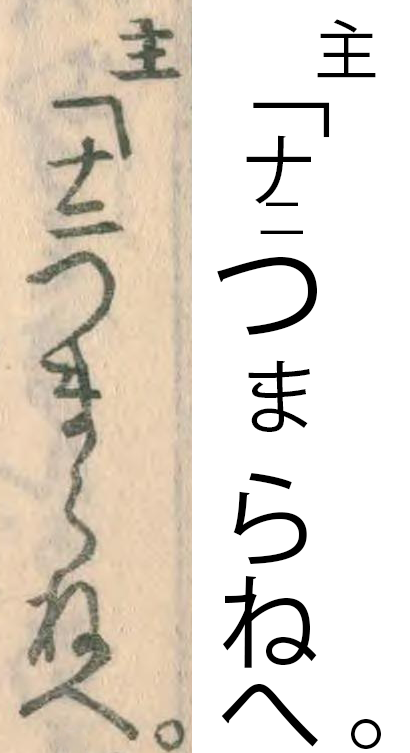 This makes it unlikely that it would have been used here (though it is certainly still possible, as this copy of Umegoyomi was written in a cursive script, which frequently used simplifications that were then later made standard with the post-WW2 orthographic reforms). Edit 2: from a comment below, it's pretty clear that the first kanji is 「内」. First of all, this is reminiscent of the use of that kanji to write 「かみさん」 as 「内室」 previously (see fig. 7), and makes sense in terms of meaning, as before. Second, the kuzushiji form of the kanji matches the typewritten one quite closely. Finally, as with 「内室」, 「内君(うちぎみ)」 is a compound word with its own reading/meaning ― in this case, it's a polite word for another person's wife. Edit: also with yudantaiteki's help, it looks like the kanji after 「内」 is 「君」. Now this doesn't make sense based on the readings, but it fits in terms of function, since 「くん」 is used for a purpose similar to 「さん」. The bottom of the calligraphed kanji might not look correct, but after finding examples such as the one in fig. 10, I was convinced. Note that the verb 「かくさづ」, spelled 「かくさず」 in modern kana orthography, is the verb 「隠す」 ("to cover up"/"to conceal") in the imperfective form （未然形）, 「かくさ」, followed by the negative auxiliary verb 「ず」. In fig. 9, we see the refrain 「いゝじやアありませんか」 repeated, with Yonehachi once again expressing her supposed disinterest in the entire issue of Tanjirou having a wife (though that's obviously not actually the case). Note that the use of 「ヱ」 at the end of the sentence is phonetically identical to the previously encountered (see fig. 4) dialectical pattern 「かへ」, which is equivalent to 「かい」 in modern kana orthography. I'm not 100% sure but かみさん seems 「内君」, not 「円君」. 内君 is usually pronounced as ないくん (but pretty uncommon in modern Japanese), and the meaning is basically same as かみさん/おかみさん/お内儀. According to this link, 尾崎紅葉 added same furigana to 内君. Sounds correct to me, thanks a lot!